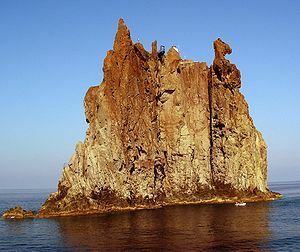 I recently travelled to norther Sicily, and hopped over to the Eolic Islands, where the diving was rumoured to be good. First impressions in Milazzo we mixed: the town seems nice enough, though there seemed to be a bizarre shortage of restaurants and an abundance of ice-cream parlours. Multiple fishing vessels came to shore at night, many sporting monofilament nets. Local fishermen (no fisherwomen anywhere) seemed to carry an abundance of small tuna-like fish in their iceboxes. Next day, Stromboli didn’t disappoint. Black volcano ash masquerading as beach sand, calm blue mediterranean waters and the midday sun welcomed us on arrival. Stromboli was grumbling with rock and smoking away into the night, when we watch it erupt in fireworks. Strombolicchio was the diving site of choice in the morning. The beautiful little island is surrounded by a small marine reserve, at least in theory. Before immersion we passed 5 gill net suspension buoys, some only a metre away from the vertical cliff walls. Immersion was good, the water warm and clean. The coral and anything living in the rock was a delight, the current fun and the rock wall a marvel. Fish larger than my thumb could only be glimpsed below 37 metres (how long are those gill nets?). No fish in Strombolian waters for divers to see, then. Just plenty of fishing nets. This entry was posted in Ocean Law and tagged bearing witness, illegal fishing, overfishing, Sicily. Bookmark the permalink.